BUJUMBURA, Burundi — Violence from coordinated attacks on three Burundian army installations killed 87 people, an army spokesman said Saturday, showing the escalating turmoil over the disputed third term of President Pierre Nkurunziza. More than 150 armed men raided the army facilities Friday and 79 of them were killed, army spokesman Col. Gaspard Baratuza said Saturday. Eight security agents, four from the army and four from police, also died in the fighting and 21 security officers were wounded, he said. Baratuza said forces arrested 45 members of the unidentified group that attacked the military installations. 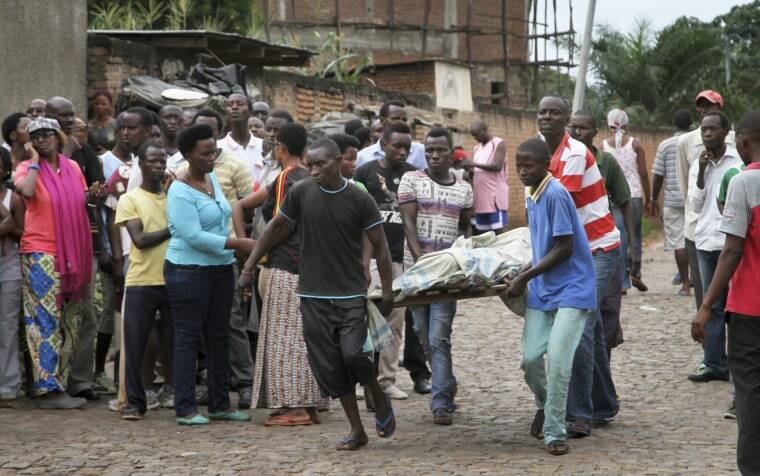 It is not clear if the army's number includes all of the 28 people whose bodies were found Saturday morning on the streets of Burundi's capital, Bujumbura. Residents of the city said that security forces searched houses and dragged out people and shot them, some with their hands tied behind their backs. A climate of fear has engulfed the capital, Bujumbura, after the sounds of battle could be heard throughout the day Friday and overnight. Residents hid in their houses leaving only security personnel patrolling the streets. Related: Troops Could Be Sent to Burundi if Violence Worsens: U.N. Some residents ventured out of their houses Saturday but largely remained uneasily in their neighborhoods. "What is the international community waiting for? Will they intervene when there are no more people in Burundi?" asked businessman Gerald Bigirimana in Nyakabiga while pointing at one of the bodies lying on the streets. The body of a 14-year-old boy was found in the Jabe neighborhood, a witness said. James Ntunzwenimana was shot dead while going to buy sugar, said the witness who spoke on condition of anonymity because he feared for his safety. In the Nyakabiga neighborhood residents said they woke up to the shocking scene of dead bodies sprawled out on the streets. Witnesses said the security forces killed unarmed men. An eyewitness told The Associated Press he counted 21 bodies with bullet wounds in their heads in Nyakabiga Saturday morning. Some of the dead had their hands tied behind their backs, said the witness, who insisted on anonymity due to safety concerns. "I fear I can be killed like my friend yesterday, police came to search our house and by chance I escaped. If I had money, I would go buy a passport and flee," said Fidele Muyobera, 22, who works as household help. In Nyakabiga soldiers pursued some of the men who attacked military installations in Ngagara and Musaga neighborhoods, said Baratuza, the army's spokesman. He declined to take questions from journalists. Baratuza Friday said the attackers' intention was to steal weapons to use to free prisoners. Hundreds of people opposed to the president's third term have been imprisoned since April when it was announced that Nkurunziza would stand for a third term, sparking months of violent street protest and a failed coup. The United States said it is "deeply alarmed" by the violence in Bujumbura, said a statement released by John Kirby, a State Department spokesman. The U.S. called on neighboring countries to start urgent negotiations between Burundi's government and the opposition to defuse the situation. The U.N. Security Council late Friday strongly condemned the violence, and U.S. Ambassador Samantha Power said the council should look at "how the international community can protect civilians from mass violence, including for the possible deployment of a regionally led peace support operation." At least 240 people have been killed since April and about 215,000 others have fled to neighboring countries, according to the United Nations.